A.When working with saints, would you ever just ask for their help or would you do what other magical beliefs do and try to evoke or even invoke a saint? B. My plan is to get a white candle, anoint it with special oil no. 20 (I don't have the Archangel Michael oil and I want to do the job today), dress a printed out photo of Saint Michael, put it at the bottom of a candle, and carve his name on the candle......Is this right? C. I was just wondering if I should put another candle for me, since I'm asking protection for me? D. When it comes to offerings, I was planning on offering him some water, salt, rose petals, a white candle, and maybe some fruit. Is this acceptable? Would it be appropriate to give him the offerings before or after the work is complete? For saint Michael, I use a red candle, and you can print a picture out and put in on the front of a glass encased candle. If you are using a free standing candle, you can carve his name on it, and I would put his picture in a picture frame. You can offer him water while the candle is burning and say his prayer. I am not sure why you are offering salt. If you want to thank him, you would give it to him after. When I petition him, I just use a red candle without oil , his picture, and some water. I have used him in addition to my own protection, but now I just work with him because I trust him. You can also recite Psalm 34. After your nine days of prayer, you can make an offering to a charity in his name. There are many of those. The color of the candle is usually white or red. The candle can be dressed with extra virgin olive oil, if you do not have saint's oil, or angelica. Angelica is the herb used in accordance with St. Michael and actually all of the angels. 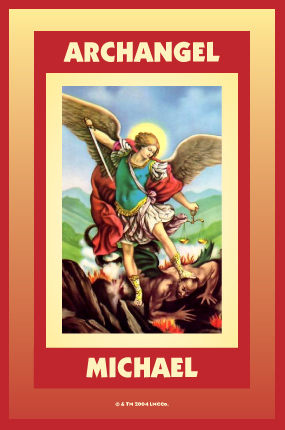 How does St. Michael help you? How does he protect you? I heard he can be really mean and nasty to ones that try and hurt you? is this true? just wondering because i am thinking of doing his spell..any information would help! thanks! Re: How does St. Michael help you? Archangel Michael mean unto like God. Or something like that so he is the closest Saint you are going to get God. Anywhoo, he will strike down anyone that is going to try and hurt you and do evil to you or the person you protect. I wouldn't say he is mean, but he is going to do whatever it takes to protect you. He is an excellent protector. starsinthesky7 wrote: Archangel Michael mean unto like God. Or something like that so he is the closest Saint you are going to get God. Anywhoo, he will strike down anyone that is going to try and hurt you and do evil to you or the person you protect. I wouldn't say he is mean, but he is going to do whatever it takes to protect you. He is an excellent protector. Just thought I'd share this little story with all of you. I haven't really had a relationship with St Michael Archangel since I do other protection, but last night I petitioned him and did a mini FWP spell for a friend with great results. My friend's disabled and some sickos she's met a couple times sold her photos to a fetish web site. The people who're involved denied responsibilities, and it'd be extremely hard for my friend to take legal actions since they are in another country. There're other IT-related solutions, but they all looked hard. I didn't have a St Michael holy card, but I got my candles, incense and graveyard dirt - this one's from LM - prayed long and hard to St Michael to strike down these sickos and make them remove the photos. That he'd watch over my friend like he does with many others who come to him and I'd honor him as my special protector. He came through this morning! The sickos did what they're supposed to do, no more drama. Saved my friend from a potentially never-ending nightmare. Thanks St Michael again, and I wish all of you a wonderful new year. I am so happy to hear that St. Michael brought about the justice your friend deserved and the protection she needs. Please teach her how to keep up the good work so she can keep herself under his care. That's a great testimonial. I'm happy for her. Thank you St. Michael for protecting me and my family. Thank you for fighting this battle for us! I agree St. Michael is a great protector, make sure you show your appreciation where appropriate. I work with him everyday, and he's an amazing protector, healer, guide, and assistant when you develop a close relationship with him! As I backed out of my parking spot at the market today, I felt "pressure" on my foot and I breaked immediately. Even though I had checked my review mirrors and did a quick backwards glance, there only 6 inches from my car was an elderly man just standing there taking a break in his walk to the store. I came so close to hitting him with my car. I don't even want to think what "might" have happened. 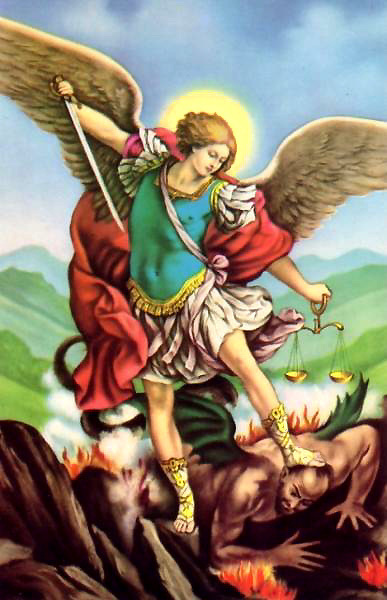 Thank you Saint Michael for protecting me from disaster today. Thank you for your protection every day. Thank you St. Michael for saving my tush once again. Thank you for coming through for me in such a precarious situation. May your name be praised always! Thank you St. Michael and St. Christopher for keeping me and my belongings safe during my travels! First time I’ve traveled for vacation since I began using LM products and the above named products (in addition to using the All Saints oil which smells like heaven literally) worked like a charm … smoothest running vacation ever! Archangel Michael's candle is red or white, as Mary says. We make ours in red, but white is good for anything, however, if you do not have a coloured candle. Special Oil #20 is an all-purpose oil and will work fine on any candle. Special Oil No. 20, 4 oz. I have never seen people offer an angel Salt. Salt is for your protection, and is not a normal offering, as starsinthesky7 also noted. I have seen people offer Saint Michael Cinnamon Red Hot candies in a little dish. Another prayer said in conjunction with protection is Psalm 91. As an Archangel, Michael is not like the Saints, who are customarily given rewards. As he works for you, you may donate a thank-offering to any charity named after Saint Michael, as Mary noted, and this will be pleasing, but Michael's role is far exalted beyond that of a Saint. He is one of the seven Archangels of God and his name actually means, "He who is like God," which indicates that he is the angel most like God, most powerful, most noble. His weapon is the sword, and another way to thank him is to make a donation to your Police or National Guard, or to any organization that protects the weak. Now I understand the red hot on the altar! Thank You! I love Saint Christopher fro travelling. I have peititoned him successfully many times while on the road and always found the safety i desired. A heart felt thank you to st Expedite for speeding up the spell work to get my bf out of the stressful situation that he didn't deserve to be in! You are truly amazing and I don't know how I could ever repay you! They do make a fantastic combination in the right situation! THANK YOU SAINT JUDE. I APPRECIATE WHAT YOU'VE DONE AND THE THINGS YOU WILL DO IN THE FUTURE. THANK YOU SO MUCH. MANY BLESSINGS. I WILL SPREAD YOUR NAME WITH HONOR AND LOVE. I am new to the forum and I'm sorry my first post is looking for help! Anyway, I had a reading done on a love situation, long story short, I'm stuck in a three-way love triangle. My reading was hopeful, but cautious in that my ex is conflicted. he feels he needs to "help" this woman, even though he wants and feels he should be with me. the reading concluded that "my rival" has indeed "tied" my ex to her, as well as sending negativity/evil eye my way. Earlier readings have advised that we are soulmates, intended for each other but that a few people seem to be against us and will try to keep us apart, and so far circumatance and undue influence from others is what parted us a few months ago. He concluded that I needed a cleansing (which I completed) as well as a 21 day Revocation to St. Michael, which I am in the process of completing. I've tried digging it out, around it but it keeps going out. So should I annoint my last candle and move forward or should I start the 21 day Revocation again? If I annoint the next candle, I will still have to purchase another one to complete the 21 days, but I don't know what to do with this candle?? Any advice would be great. My Santero is away so I am unable to seek him out for advisement until lhe returns later this month. Well, this is a forum for hoodoo, not Santeria, so we're not able to advise you on what actions you should be taking in the context you've been working. As this is a Lucky Mojo forum, for the discussion of LM products and services only, it's also outside of the bounds of this forum to speak to candles and products that are not from LM. Did you get your candles from LM? Otherwise we have no frame of reference to speak to why they may have burned oddly. Also, do you mean evocation of St. Michael? To revoke means to take-away, whereas evoke means to bring the energy/effect of something into one's presence. I have no idea what a "revocation to St. Michael" would be. But an evocation of St. Michael would be working to get his influence and aid through ritual. My advice would be to contact another Santero that you know and trust and ask them what you should be doing. St Jude, I appreciate your helping me get the $400 I need for my propane bill. You really came through for me when my ex boyfriend could not. Thank you for keeping me and my cat warm. St Michael, thank you for getting the two people who owed me money to pay me, and I'm so happy that you got the evil credit card company who overcharged me to issue me a check. Thank you for fighting for me. Thank you for undoing those wrongs. Thank you for protecting me. What a powerful combination of a saint and an archangel -- great going with that pair. Thanks so much for your response, my apologies I was not aware that the forum was related to Lucky Mojo products alone. I haven't purchased anything yet, I'm still trying to figure out the next phase of work to be done. I've decided to re-start my Revocation (yes it's revocation). I've prayed about it and it seems like the best option for me. Also I am going to start a new post in order to get advice on which direction I should go in. Jen, i'm glad you dropped by, but as Devi said, you're basically in an extension of my shop, the Lucky Mojo Curio Co.
Our practice is African American hoodoo. As in the United States of America, Southern States, Black People, Folk Magic. We welcome people of all cultures, all skin colours, all nations, all faiths, all traditional paths -- but you will not be able to get Santeria advice from the moderators here, because even though each of us has a religion (or is multi-faith), we actively avoid discussion of religious topics here, to keep the space welcoming to all. So .. sorry, we cannot get into Santeria here for you. That having been said, in this particular instance, i would advise you to contact another Santero, as Devi said, because the advice you get here will come out of our rootwork and conjure practice, not from Santeria. JCPA72 the equivalent in hoodoo to a revocation would be a Reversal trick, Lucky Mojo sells reversal candles and double actions candles, they have the same effect, you can use either, there are instructions on how to use these items on the Lucky Mojo site. If you wish to work with Saint Michael the Archangel all you have to do is read the revocation prayer as the black part of the candle starts to burn. 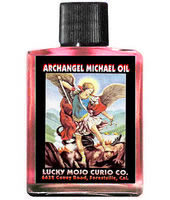 You can also purchase Saint Michael Oil from Lucky Mojo and add it to the candle along with Reversal oil. I recently needed work to be done for a loved one in a court case matter where they were falsely accused. I thought that I would need outside help on this work, but it turns out I was able to take it on by myself at such an unfortunate time. Well, the matter was finally brought to trial after a long delay from the opposite party. Everything I put in place turned out to be VERY successful. Along the way, lies have been exposed, people were shut up and others have been sweetened to my loved one's favor. During the hearing the opposing counsel was at a lost for words, was not prepared and the opposing witnesses and defendants were caught in their lies on record! The matter is not officially complete just yet, but I just wanted to thank Archangel Michael, Just Judge, St. Raymond, St. Expedite and St. Jude for their intercession because I know that everything is happening for our ultimate favor. I still feel them with us and I consider myself blessed and honored that they would assist us in this matter. I petitioned St. Expedite during the initial phase of this all, I wanted it to all go away quickly, but St. Expedite did not allow this to happen. And now I see why. I couldn't figure out why He would want something like this to go on and on and on, I read on it, He said he would help me, but I did not see it because I didn't see the END QUICK enough.Now, it is so clear, he was indeed helping me how and when I needed to be helped, and I am thankful that he still shared his wisdom with me, it has been a learning experience, a growing experience and this situation has brought about the change of a dysfunctional system, one I am honored to think I had a part in disorganizing for a better, greater good. I also want to thank Lucky Mojo for their candle lighting services. I was able to navigate through some of the mess by having lights burned at the church and the results provided a lot of guidance for me when I was impatient, frustrated and had clouded judgment. I was just sitting here looking at my own personal alter and thought I would give public thanks to all. This situation has really shown me how much strength I have and I am grateful for it. All this I did alone on so many evil people working against one individual....it has been a stepping stone in my personal spiritual journey for sure. This is a great testimony mommystwin27; this is a perfect example of the use of Customer Testimonials in the forum, it tells others what has been accomplished and what can be accomplished. Keep up the work and may your petitions be answered. That's why I say I am proud to be a member of Lucky Mojo Forum. I keep a Saint Christopher card in my car and sneakingly hid one in each of my immediate family members cars. He protected my my son today; he was involved in a car accident and walked away with minor contusions. Thank you Saint Christopher, you are a great and powerful Saint and will always have a place in my home, my life and my families. Thank you. "Thank you Saint Christopher, you are a great and powerful Saint and will always have a place in my home, my life and my families. Thank you." Beautiful jwmcclin. Thank You, Saint Christopher ,especially for ongoing prayers for safe travel now and in the future, for My Family, and for me. Wanted to thank Archangel Michael for the protection he has surrounded me with. Thank you for protecting me, my son, and my family. Thank you God for giving us access to the great Archangels. Thank you Archangel Michael for protecting me, and more importantly, those that I love, from any person or entity that attempts to harm us. Please continue Protection, and I ask for Protection now and always for My Family, My Entire Family. Strike out any person or entity that will certainly fail against Your Mighty Sword. I would like to thank St. Michael the ArchAngel for protecting me. THANK YOU!!! Recently I was placed in a situation where someone's anger was displaced on me. Since I felt very threatened I turned to St. Michael requesting help and protection. I made my petition in the evening and anointed myself with Lucky Mojo's Fiery Wall of Protection oil. I felt like I needed additional support so I also purchased a Lucky Mojo candle service with my petition to St. Michael. The next morning I received a very long apology from the individual and have not heard another word from them. Thank you St. Michael for coming to my aid so quickly and bringing safety to me and my loved ones. I am truly thankful for your love and protection. I also want to thank Lucky Mojo for their supplies and services that are so very wonderful. I am comforted knowing a light will be set for me to further support my request. I feel confident when applying the Fiery wall of Protection oil, and it also smells wonderful. Re: Thank you St Michael! What a beautiful post! Thank you for sharing JeHanne! What is proper payment to St. Michael? I haven't done a lot of work with him, but he's worked very hard for me and I want to be sure to thank him appropriately. If this has been addressed, please direct me to the link. I did the search but didn't find what I was looking for. Archangels work on a level different from the saints. You often will find people giving offerings, ex votos etc to saints, but Archangels not so much. Saint Michael seems to be the only angelic being that people actually do give things for. For example, we rarely hear of offerings or things given on behalf of Archangel Gabriel, Raphael, Uriel etc. The reason for this is that angelic beings do the will of the Creator without anything in return. If you call on them, they answer. The only caveat is to treat them with respect and honor them, but payment is not always necessary. That said, giving a donation is a great idea. It is like going the extra mile. Consider leaving a candle as a physical thanks, or giving a donation like Starsinthesky mentioned. Another common donation is getting a milagro and leaving it at his statue at a local church. I'm so glad you have found this information. About a month or so ago, I had a dream in which St. Michael came to me. He just introduced himself, but nothing else was said. I took this as a sign of needing to connect to him. Ever since, I've been reading as much as I can on Him. I've put up a small altar to him that consists of a St. Michael 7 day candle and an 8x10 chromo print. I've been speaking with Him and praying to Him on a daily basis. Just basically connecting with Him on a level that I can understand. Even though I've only gotten 1, maybe 2 responses, I know that He is there. I agree 110% with ConjurmanAli. Working with The Archangels is on a very different level. Thank you beautiful Archangel, St.Michael, for assisting my son overcome all obstacles - some of them seemingly insurmountable. Thank you for answering our prayers - today my son recieved the call that he has been accepted into the NYC Police Department Academy. I can't say it enough - thank you St Michael! Thank you St. Archangel Michael for your aid in comforting me. I will continue to look to you for protection and comfort. Again, thank you. Many, many thanks. Thank You Saint Michael and Guardian Angel!!! Re: Thank You Saint Michael and Guardian Angel!!! Thank You Saint Michael,Jude,Martin C., Expedite, and Guard. Saint Michael, Saint Jude, Saint Martin Caballero, Saint Expedite, Saint Ann, Virgin Mary and Guardian Angel for helping me during these trying times!!!! I love You!!! Re: Thank You Saint Michael,Jude,Martin C., Expedite, and Guard. Good work. Im glad they all came through for you. Thank you St Michael for helping me and for protecting me for those three weeks. You heard my petitions and you kept me safe. I am so very thankful! Thank you St Christopher and St Michael for protecting me before hand your amazing Saints and I believe in your power. I have a cool 3-D St. Christopher holy card from Lucky Mojo. One image on the card is St. Christopher, the other includes an automobile, a plane, a train, and a ship. for the support and help I received in receiving a job. Thank you St Michael for protecting me and for sending the neighborhood thief back in jail.